Diego, CA. DTx Pharma, an RNA medicines company breaking open new therapeutic areas for oligonucleotide therapeutic s, was named by the San Diego Venture Group (SDVG) as one of their 30 Cool Companies of 2018. 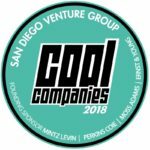 According to their website, the SDVG considers cool companies to be among the fastest growing and most exciting start-ups in Southern California. DTx Pharma was featured, along with the other 29 Cool Companies, in the San Diego Business Journal (SDBJ Article Link).